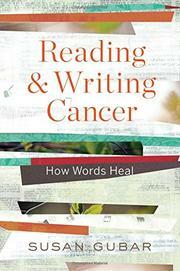 For cancer sufferers, words can lift the spirit. Literary scholar and memoirist Gubar (Emeritus, English/Indiana Univ. ; Memoir of a Debulked Woman: Enduring Ovarian Cancer, 2012, etc.) believes she has “been kept alive by a clinical trial and by the New York Times,” where she contributes the blog Living with Cancer. Reading about others’ experiences with the physical, emotional, and medical tolls of the disease, she writes, has made her feel less isolated. She recommends both, offering helpful advice for those who want to write and candid, insightful responses about the huge number of cancer memoirs—and fiction featuring cancer sufferers—that she has read. Two chapters focus on writing. In one, Gubar offers advice for getting started, with the well-worn strategy of free writing; the other focuses on the particular challenges of blogging. Daily writing, writes the author, “does more than provide an outlet for venting without self-censorship. Even when it tackles the miseries of treatment or the disease’s progression, it can also become an escape hatch” and distraction. The miseries of treatment are a frequent theme, as cancer sufferers recount “inadequate doctoring, medical mistakes, alienating hospital environments, economic burdens, and imponderable decision-making that baffles patients confined within ever-circumscribed lives.” Many writers rail against doctors’ lack of compassion and “inflated egos and insensitivity” even at prestigious cancer centers. When Gubar began her blog in 2012, she resolved not to present cancer as a gift that afforded her some special insight. “I begrudge its existence,” she writes, “and bristle at any suggestion that such a pernicious disease can be considered a rewarding opportunity.” Nevertheless, writing about cancer has been “creative and deeply satisfying.” Drawing on her experience, the author provides several pages of strategies for generating a blog entry: a solution to a cancer-related problem, for example, or explaining why a new word (“scanxiety” or “chemoflage”) is needed. Bright, upbeat, and empathetic, Gubar argues convincingly that words have the power to heal.